From Philadelphia to Palm Beach to Carnegie Hall, Stefan's tour with the Russian National Orchestra last night was an unqualified success, with each performance garnering new rave reviews. See below for some of the highlights! "...In between came Prokofiev’s Violin Concerto No. 2 in G minor, with the stirring young Stefan Jackiw as soloist. Mr. Jackiw, in a program note, charmingly tells of having discovered this concerto in 1999, through the film “Analyze This,” starring Robert De Niro and Billy Crystal. This March, Stefan will embark on a seven-city tour with the Russian National Orchestra, including his Carnegie Hall main stage debut on March 2nd, performing Prokofiev’s Violin Concerto No. 2 in G minor under the baton of Mikhail Pletnev. Kirill Karabits will conduct the remaining six dates, with stops in Pennsylvania, Delaware, and four performances in Florida. In addition to the Prokofiev, Jackiw will also play Mendelssohn’s Violin Concerto in E minor, Op. 64. Stefan and frequent collaborator Jeremy Denk have just finished their tour of Charles Ives’ violin sonatas, with critically-acclaimed performances in New Jersey, Maine, Philadelphia and New York City. This November, Stefan joins forces with frequent collaborator, pianist Jeremy Denk, for a tour of the complete sonatas of Charles Ives. They will perform the cycle at several venues, including at New York City's 92nd St Y and at the Philadelphia Chamber Music Society. Prior to the Ives tour, Stefan returns to Amsterdam's venerated Concertgebouw with the Netherlands Philharmonic and makes his Tokyo Symphony debut under conductor Krzysztof Urbanski. Stefan has garnered a string of superb reviews for his performances of the Mendelssohn Violin Concerto with the Australian Chamber Orchestra. The Sydney Morning Herald raved, "Jackiw returned to end the concert with an earnest, breathless and strikingly accomplished performance of Mendelssohn's Violin Concerto in an arrangement by Richard Tognetti for 10 string instruments plus soloist. 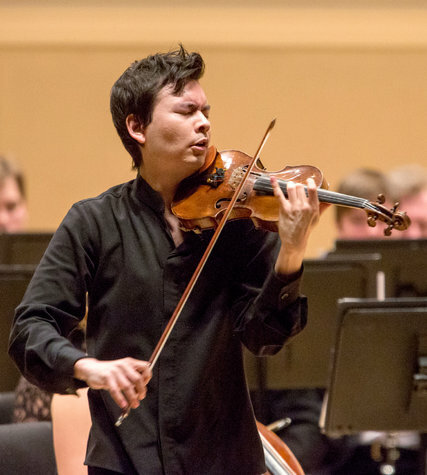 This summer, Stefan returns to the Aspen Music Festival, where he performs Mozart's A major violin concerto and gives the Aspen premiere of Lutoslawski's Partita for Violin and Orchestra. While at Aspen, he will also lead and mentor a student ensemble in Brahms' B-flat major string sextet. Stefan also joins renowned violinist Gidon Kremer and the Kremerata Baltica on tour and will appear as soloist with Kremer in works by Mozart and Schnittke and in chamber music alongside Kremer and principals of the Kremerata. Stefan received an excellent review from the New Jersey Star-Ledger, following his debut with the New Jersey Symphony and frequent collaborator, conductor Christoph König: "In the gypsy-tinged, showy work [Ravel's Tzigane], Jackiw displayed lush vibrato and plenty of bravado as well as impressive dynamic control and a sense of drama.